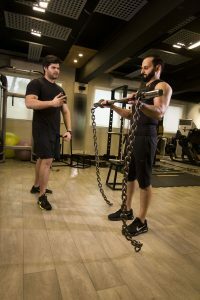 Our workouts are designed following a 7-step full-body assessment which allows us to determine the client’s fitness level and quality of movement. We then develop programs at that follow the fissions fusion training system developed by Amir Siddiqui. This system works with the dynamic and ever changing nature of the human body to nurture it through controlled cycles of stress, disruption and adaptation taking each body to its unique potential. Our rigorous routines combine cardio and resistance training in a 30 minute supervised workout (not including warm up) that is aimed to develop your form, function, stamina, while guaranteeing your goals! This combines multiple movements and muscle group activation to launch our clients into accelerated fat loss. It is divided over four phases to cater to clients of all levels – beginners to regular gym-goes looking for a shred. A four stage fusion style training program hitting every part of your body every day. Anterior posterior, functional kinetic chain emphasis (body angles), you name it we cover it within 30 minutes. This program is divided over varying levels of progression as well. Our sculpting program for athletes who already boast good stamina and functional mobility but unable to sculpt their body in the way that they want to. This program is devised specifically and used sporadically to break plateaus our clients face in meeting their goals. Fission annihilator is a high volume body building style programme geared to build Muscle mass and is usually paired with higher calorie diets. A lighter version of our movement based programs where we manage abdominal stress with each trimester. Our focus is on keep our pregnant clients moving for a healthy delivery.